I’ve been reading Jonathan Fields’ latest book, Uncertainty. I’ve also been watching him launch the book, which has been equally interesting. He’s an experienced and productive book marketer, but the new book is very personal. A lot of what he is teaching about uncertainty has come from his own experiences working in vastly different fields. He’s been a lawyer, an entrepreneur, a yoga studio owner. There’s a major section of the book that concentrates on what he calls Attentional Training. This covers lots of different techniques to help you get control of your own mind through training. Fields explains how he mastered his fear of risk, judgment and failure and how others can use his method to do the same. He shares a set of detailed daily practices, workflow shifts and environmental changes for eliminating the bad side of uncertainty—the anxiety, insecurity and lack of focus that can prevent a project from ever getting off the ground or reaching its full potential. Throughout the book Fields is logical, instructive, open and frank about his own experiences and what he learned from them. One of the things I’ve most enjoyed about the book is the stimulus to think about exactly why it’s so difficult to do new things, to make a complete change. When we want to change, it sometimes seems to threaten people we know, or other parts of our own psyche. The reason this is important to me, besides having to deal with lots of outcomes in life that weren’t always what I planned, is how often this comes up when I talk to writers. 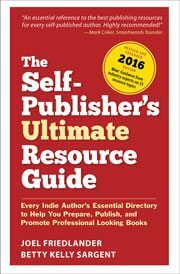 What evokes the fear of change the most is the prospect of book marketing. or other stories. They are like stories we tell ourselves as kids to get a scare. What’s really going on here, I suspect, is that the person thinks they will have to completely change their personality, become someone inauthentic, to succeed. Of course, nothing could be farther from the truth. For instance, this book launch was kicked off by one of the most personal and emotional book trailers I’ve seen. It’s compelling theater, and a great advertisement for the book. But in imagining these possible futures, we can’t escape the power of uncertainty. All the fear is really expressing our profound dread of change, of diving into something uncertain. As Fields points out in his book, and in his life, resisting change is impossible. All that’s left is learning to embrace it. Learn to love uncertainty. The energy it unleashes can power our creative lives. Jonathan Fields is an empathic and wise guide on this journey, with much to offer. 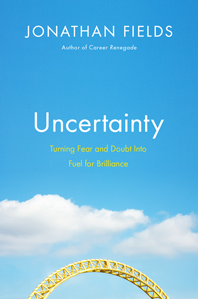 Uncertainty: Turning Fear and Doubt Into Fuel for Brilliance at Amazon. It will be published on September 29, 2011, and is already an Amazon bestseller through pre-orders.